The Industrial Way / Oregon Way Intersection Project is located at the intersection of Industrial Way (State Route (SR) 432), Oregon Way, and SR 433, a critical connection of two Highways of Statewide Significance and part of the National Highway System that support significant passenger and freight truck movement. It was chosen from a suite of more than $ 356 million in projects identified along the SR 432 corridor during the SR 432 Highway Improvements and Rail Realignment Study, completed in 2014. This project was chosen because it will have the greatest benefit to safety, congestion, vehicular mobility, travel reliability, and state and local economies. 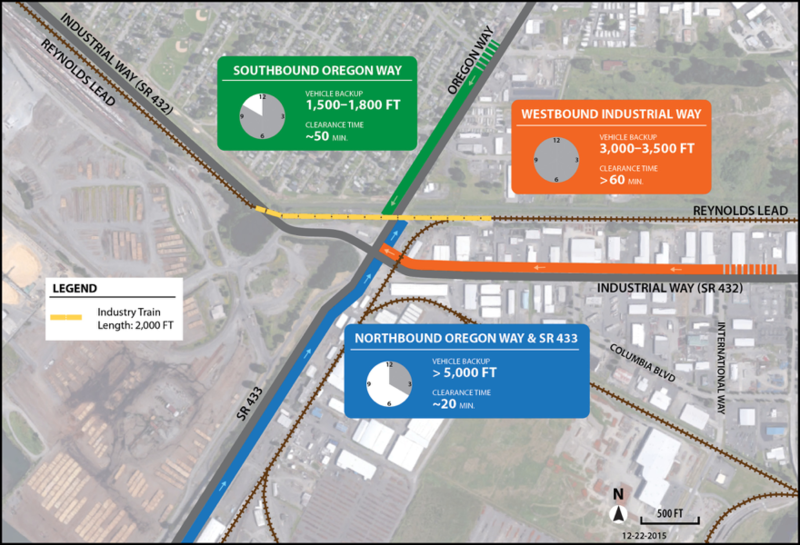 Completing the Industrial Way / Oregon Way Intersection Project is an important component of the long-term economic vitality of Cowlitz County by maintaining critical access to commercial and industrial areas, the Columbia River, regional employment, education, emergency response, and recreational facilities. What is planned for this project? Existing Year 2015: The intersection generally accommodates the existing number of vehicles using the roadway; however, the intersection experiences heavy congestion during the PM peak hours with backups that are longer than the available storage distance for most turn movements (Exhibit 1). Future Year 2040: Traffic volumes are expected to increase 40-50 percent by 2040. Traffic demand at all left turn and some right turn movements is expected to exceed the capacity of these lanes (LOS F), causing long backups that exceed their available storage distance, which in turn impacts through traffic movement (Exhibit 2). 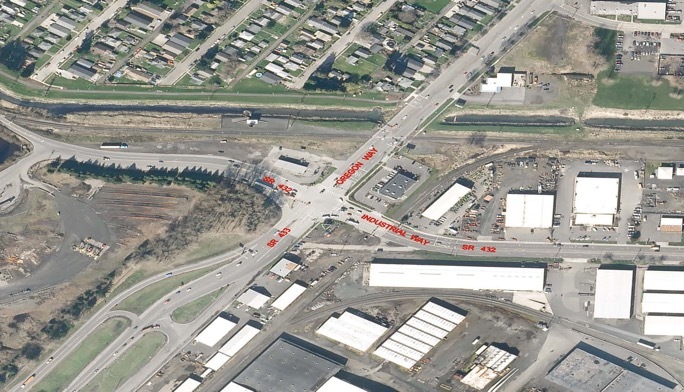 The overall intersection congestion will result in failing conditions (LOS F) where drivers experience significant backups, waiting two or more signal cycles to pass through the intersection, and an intersection that is unable to accommodate the number of vehicles traveling to and from the Lewis and Clark Bridge. It is clear that congestion will worsen by 2040, greatly impacting traffic mobility, with future vehicular traffic demand taxing the capacity of the intersection, resulting in significant traffic backups and delays. Much of the land south of Industrial Way is zoned industrial and abuts the Columbia River, which is compatible with manufacturing and export/import operations due to the river’s deep-draft navigation channel. Approximately 70 percent of these waterfront properties have active industrial operations whereas the remaining 30 percent are expected to develop within the next 5-20 years. With projected industrial growth and development of these waterfront properties, including lands west of the intersection, an increase in train operations on the railroads in the vicinity is similarly anticipated. Currently, an average of 4 trains cross Industrial Way and Oregon Way per day. Existing trains traveling on the Reynolds Lead track routinely block the roadways between 5 to 7 minutes. One train traveling westbound through the intersection, causing a roadway blockage of 5 minutes during the PM peak hour, results in backups that extend between 600 and 2,000 feet in length, and require about 15 to 20 minutes to return to non-blockage conditions (Exhibit 3). By 2040, 24-30 trains (inbound and outbound) per day are anticipated to cross the intersection and will be unable to avoid the peak periods. Trains will routinely block the roadways for 5-11 minutes depending on train speed and length. One train traveling westbound through the intersection, causing a roadway blockage of 5 minutes during the PM peak hour, results in backups that extend between 1,500 and 5,000 feet in length, and require about 20 to 60 minutes to return to non-blockage conditions (Exhibit 4). The frequency of this train activity increases the probability that freight truck and passenger vehicles will be blocked or encounter congestion. 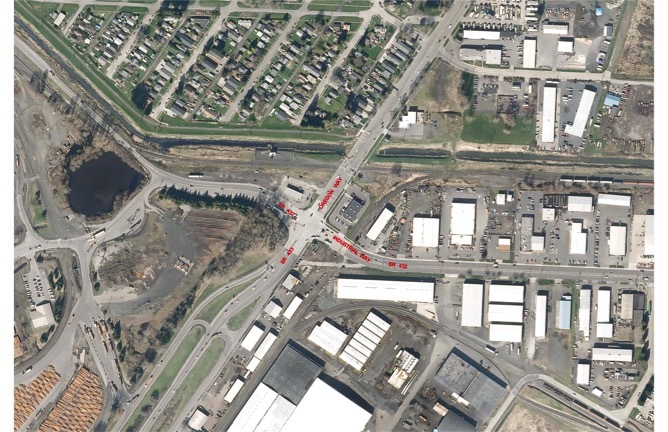 All travel through this intersection and throughout the industrial corridor and nearby roadways will be less reliable, including commuting to and from work, making freight deliveries, and providing school bus and transit service. 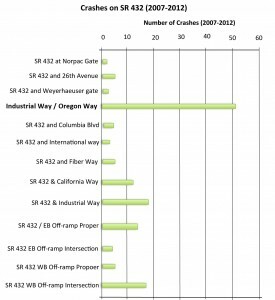 Emergency service providers routinely travel through the Industrial Way/Oregon Way intersection. The Longview Fire Department (located 1 mile north of the intersection) travels Oregon Way to respond to fire and emergency calls in the industrial areas southwest and southeast of the intersection; ambulance service returns through the intersection to transport patients to the PeaceHealth St. John Medical Center located approximately 1 mile north of the intersection. Additionally, Columbia River Fire & Rescue frequently transports patients from Columbia County, Oregon across the Lewis and Clark Bridge (SR 433) and travels north on Oregon Way to PeaceHealth. 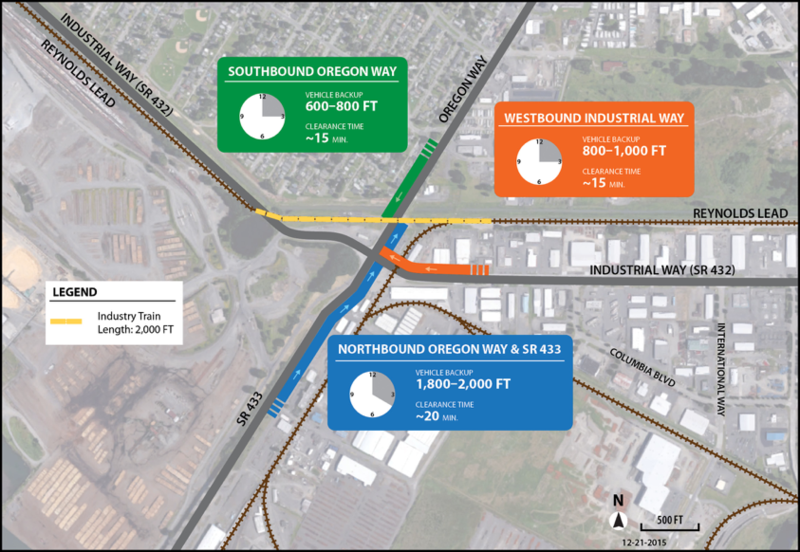 Roadway blockages from trains will exacerbate congestion on the Lewis and Clark Bridge and increased congestion at the Industrial Way/Oregon intersection will impede and delay critical response and transport times for emergency service providers. Industrial Way (SR 432) and the intersecting SR 433 are designated as Highways of Statewide Significance by the Washington State Legislature, which recognizes that both highways provide a vital transportation and economic connection between communities across the state and support state, interstate, and international freight movement. 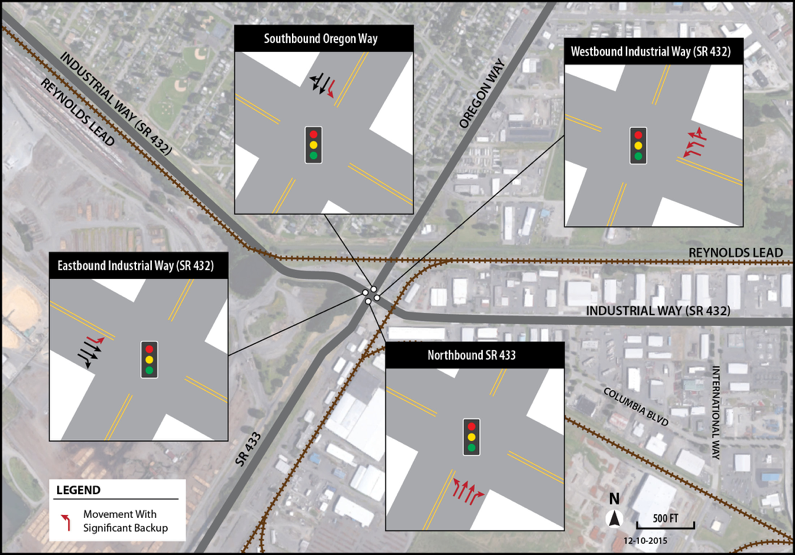 Enabling the transport of over 20 million tons of annual gross truck tonnage, the Industrial Way / Oregon Way intersection is one of Washington State’s busiest intersections in terms of freight movement by truck. Trucks typically comprise over 20 percent of the traffic volume on Industrial Way (SR 432) and the intersecting SR 433 (Exhibit 5). Ability of the Port of Longview and City of Longview to retain current tenants and recruit new ones to hundreds of acres of available developable land will decrease; thus, deteriorating the global competitiveness of the local economy and of the port in relation to other West Coast ports. 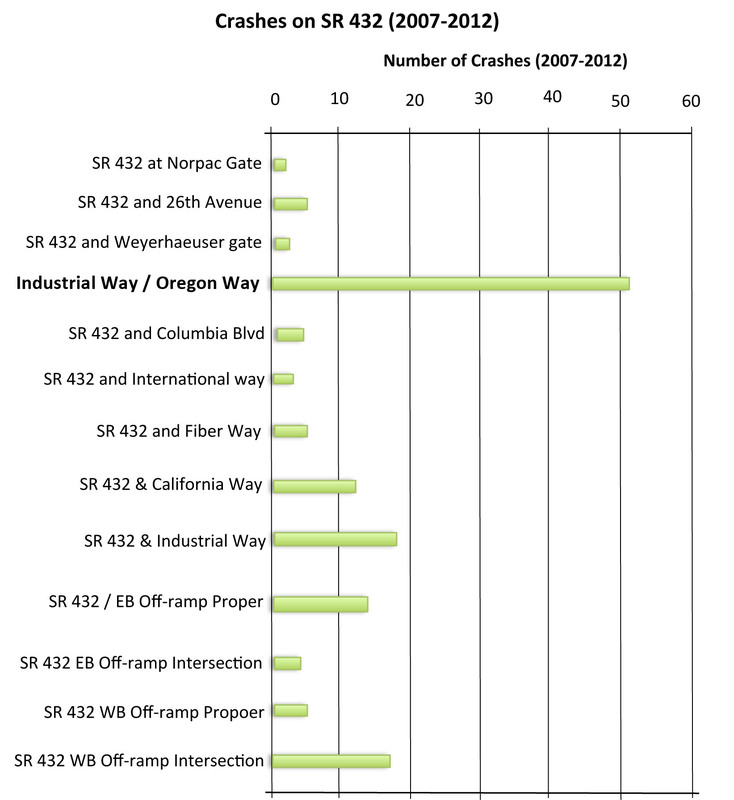 The graphic clearly shows the Industrial Way / Oregon Way intersection (SR 432 and SR 433) has the highest number of reported crashes compared to all other intersections in the SR 432 corridor. Congestion at intersections has been shown to correlate to increased vehicle crashes. As projected growth of traffic volumes occurs and the number of train crossings substantially increases over the next 20 years, drivers’ risk taking and crash rates and severity may increase, resulting in an overall decrease in safety for all travel modes. At the intersection of SR 432 and SR 433.